At Clifford Law Offices, our Chicago-based attorneys represent those who have been injured or lost loved ones in motor vehicle collisions. We can help you seek a result that covers not only medical expenses but also provides necessary ongoing support for you and your family in the aftermath of an accident. Our attorneys take the time to clearly explain your legal options suffering a serious injury in a Chicago car accident. When you schedule a free consultation, we will discuss your case via phone, at our local office, or during a visit to your home or hospital room – whichever is most convenient for you. Together, we can determine the next steps for fair compensation. We are an award-winning, nationally recognized law firm who has obtained more than $2 billion on behalf of our clients. We have decades of experience handling Chicago car accident cases. Because of our extensive experience, we have the experience to handle nearly every situation involving personal injury – no matter the circumstance. Our law firm is different; we know how to address your case efficiently and compassionately to help you receive the maximum possible compensation for your case. We treat our clients as if they are family, listening to their case and fighting for their rights, just like we would for our spouses, children, and siblings. We are responsive. When you work with our firm, you receive responsive communication through the entire case. Our clients can expect responses from all calls, emails, and other forms of correspondence. Our reputation as trustworthy lawyers gives your case immediate weight. Other attorneys routinely send us their most complex cases, confident that we can provide effective counsel to these clients. Who will pay for my car repairs? Will the other driver have to pay my medical bills? Do I have a strong case if I decide to pursue a lawsuit? What happens if an insurance company wrongfully denies my claim? The other driver was speeding/drinking and driving/texting and driving/driving dangerously when he or she caused the accident – does that affect my case? View our Car Accident FAQs to learn more and read more about what to look for in a car accident lawyer. Please note that every auto accident case is unique, and these listed results do not guarantee a particular outcome in any future cases. You can, however, expect commitment, dedication, and our full attention. The only way we have been able to consistently secure outstanding results for clients is through an aggressive commitment to our clients. When a car accident permanently impacts you and your family, discuss your case with one of the attorneys at Clifford Law Offices. How Much Does a Car Accident Lawyer Charge? Our car accident attorneys handle all cases on a contingency fee basis. This means that unless we successfully resolve your case, you will not pay anything for our time. If we do obtain a financial settlement or verdict on your behalf, we will deduct our fees directly from the award based on an agreed-upon percentage. That way – win or lose – you never pay for an attorney out of pocket. We are upfront and honest about how much we charge for services because we do not believe in hidden fees or surprise add-ons at the end of the process. Though hiring our firm won’t cost you anything unless you receive compensation, not hiring an attorney might cost you a fair settlement. Almost all car accident claimants in Illinois will recover greater compensation amounts with an attorney representing them. In fact, insurance companies often offer higher settlements as soon as they discover a claimant has hired a lawyer. In 2018, there were 118,304 motor vehicle collisions in the city of Chicago, 123 of those crashes involved at least one fatality, while 21,881 involved at least one injury. While these collisions occur all over the city, a high percentage of car accidents occur on a handful of streets. 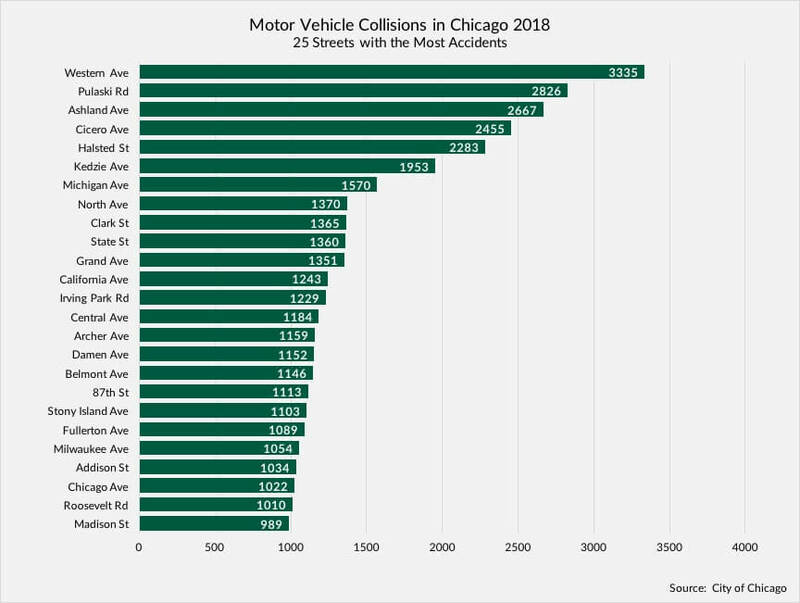 In fact, five Chicago streets had more than 2000 car accidents occur on them in 2018: Western Avenue with 3,335, Pulaski Road with 2,826, Ashland Avenue with 2,667, Cicero Avenue with 2,455 and Halsted Street with 2,283. Deadline for filing a case. In Illinois, you have two years from the date of your collision to file a personal injury claim with the civil courts, or two years from a loved one’s date of death if you wish to file a wrongful death car accident claim. Missing your deadline generally equates to forfeiting your right to file a claim for compensation. However, the law does have contingencies. Talk to our firm to discuss whether they exist in your case. Fault car insurance laws. Illinois is a fault, or tort, insurance state. This means all involved parties in a collision will look to the at-fault party for recovery. As a victim, you and your attorney will determine who was at fault for your crash and file a claim with that party’s insurance. Comparative negligence. Some car accident cases involve the negligence of more than one party. Under Illinois’ car accident laws, if you (the claimant) are 50% or less at fault for the collision, you will still be eligible for financial compensation. If you are more than 50% at fault, however, you will lose your right to recover damages. Hiring an attorney can help you prove the other party’s majority share of fault. Obtaining a car accident settlement or verdict is not a guarantee. Financial recovery hinges on establishing proof of someone else’s fault for your accident and injuries. An insurance company and/or a judge must have proof that the defendant committed the negligence that caused your crash. To establish proof, document your injuries, gather evidence at the scene (if possible and if you are able), and work with an attorney to build a strong case. Duty. The defendant owed you a duty of care. Breach. The defendant breached his/her duty of care to you. Causation. The breach of duty caused your car accident. Damages. You suffered damages in the collision. Determining liability often takes the experience and resources of an established firm. For instance, the other driver may be mainly at fault, but other parties could share liability. For example, a seatbelt manufacturer may be partially liable for your spinal cord injury if a defective seatbelt opened in a collision and worsened your injuries. Discuss your case with Clifford Law Offices for help determining liability and fault. The Chicago-based lawyers at Clifford Law Offices are ready and waiting to take your call. We can help your family maximize financial recovery and move forward. Call (312) 899-9090 or contact us online today for your free legal consultation.